An upside-down horse is likely not what you came to Prague expecting to see. But then Czech artist David Černý likes to do things differently. The horse and the beautiful Lucerna Passage it hangs in, should not be missed. On any trip to Prague, you’re certainly going to visit Wenceslaus Square. This is where things happen in Prague… revolutions, celebrations, demonstrations. And all this feverish activity is watched over by the country’s patron saint, Vaclav, who we in the West tend to know as Good King Wenceslaus. He was the Christian ruler of the country in the 10th century and was murdered by his ambitious brother Boleslav the Cruel. There he sits at the top of the square, astride a majestic prancing horse, in front of the domed National Museum. The statue was begun by sculptor Josef Vaclav Myslbek in 1887 and finally put into place in 1912, a testament to Czech honor, patriotism, and all that good stuff. But not so far away, near the other end of the square, is another King Vaclav and his horse… but with a twist of classic Czech irony. that’s sticking its tongue out but is also dead? Inside the Lucerna Passage—an elegant and decorative Art Nouveau shopping and entertainment area built in 1920—you’ll find yourself confronting another horse that, while perhaps not of a different color is certainly of a different condition. He’s dead, you see, and hanging by his feet, his poor head lolling down and his tongue sticking out. But apparently King Vaclav still needed a mount, dead or alive, and so he mounted the upside down steed, riding astride the dead horse’s belly. 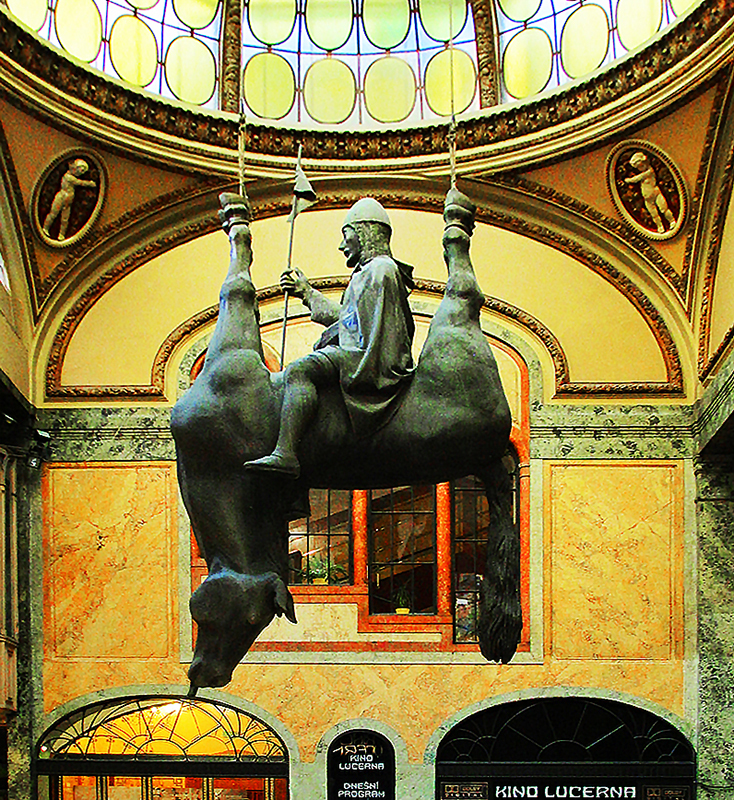 This upside-down horse, a perfect depiction of the Czech penchant for black humor, was created in 1999 by the post-modern Czech artist David Černý. The same David Černý who once painted a Russian tank that was gracing the square pink. And the same one who designed those odd babies you might have noticed crawling up the sides of the Czech TV tower. The poor dead horse and his oblivious king seem yet more bizarre surrounded by the elaborate marble work and stained glass and general Art-Nouveau kitschy loveliness of the atrium where they hang. You can’t help but wonder how that fragile and lovely ceiling can support the weight of such a large piece. But although it looks like bronze, the horse and rider are actually sculpted of foam. The building was built by Vaclav Havel, grandfather of the famous poet/playwright/dissident of the same name who became the first president of the nation after the fall of Communism (which he helped bring about). Havels are still part owners of the property and in fact, one of the stories I heard about the Upside-Down Horse involves the family. Word is that an aunt of the presidential Vaclav was a firm Royalist and ordered the statue as a statement of persistence and faith. She decreed that the king should ride on an upended dead horse until the monarchy is restored to Czech. Probably an apocryphal tale but if not, our Vaclav here is likely to have a long dead ride. Like most of Černý’s work, this bizarre, controversial but ultimately enjoyable piece of art is certainly a worthy addition to the Czech tradition of Theater of the Absurd. Note: There’s a nice cafe on the upper level of the atrium, the Cafe Kino. Just go up the amber-rose colored marble steps across from our guy here. If you can get a seat by the window looking down into the atrium, you can get a nice angle for a photo. I had coffee with whipped cream and a pastry. A bit pricey for Prague, but not out of reach and a pleasant spot. Prague is on our “must see” list for next year and Wenceslaus Square, as well as the whole city, are full of so much fascinating history, architecture and artists that we’ll have to plan on spending several days there, I’d love love to track down more of artist David Cerny’s work because I love art with a political spin and irony is always fun, no matter what nationality you happen to be! I agree. I didn’t know much about Cerny while I was there, so can’t lead you to more of his work other than the babies on the TV tower. But I’m sure you can find more. Interesting guy! That’s a pretty bizarre statue in a beautiful setting. Love the back-story- wonder if it’s true. I’ve been to Prague a couple times but never saw either of this – what a hoot the upside down one is! I assume that eventually the king realized he wasn’t making good time getting to his destination on the dead horse! At least he wasn’t beating a dead horse…. You’re right, Kay. It is a hoot, one of those things that if you’ve never heard about it and come upon it unexpectedly, just kind of stops you cold. There you are, just wandering through the passage and looking in shop windows and wondering if there’s a cafe because you need a cup of coffee, you come out of a corridor, and… there he is, just hangin’ around. I simply HAD to find out the story behind this guy. Glad you liked it. Something to look out for when we finally get to Prague. And good tip about photo angle. Thanks! Yes, the angle from the window of the cafe upstairs is interesting, because you are looking down at the statue from behind. The angle of the photo posted here is one taken from the marble stairway directly opposite this guy. I didn’t have a tripod so I just balanced the camera on the iron railing! HaHa. I never thought of that, Nico. You’re probably right… at least until that dead horse gets REALLY bloated. Hi Donna. It’s just a rough guess. Bloated? Wouldn’t that make it more comfy lol? I’ve only ridden a horse once (on the back like normal of course!) ages ago so I don’t know the difference. Mean, but why else would someone ride like this? Strange indeed! Hi guys. What an unusual statue!! Poor horse but the man seems happy enough with his bum sunk into the horses belly flab. Maybe I’ll try it out hehe. Poor horse but at least the guy is sitting happy. I bet the horse’s belly flab is keeping his bum warm. Question though…why? I’m curious now……wonder what it’ll feel like to sit on a horse this way?